Accepted Scientific Name: Opuntia dillenii (Ker Gawl.) Haw. Suppl. Pl. Succ. 79. 1819 [May 1819] Haw. 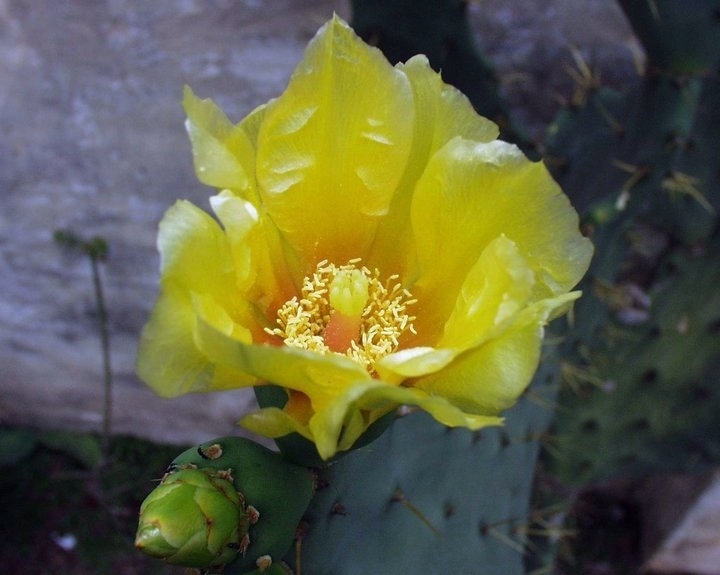 Origin and Habitat: Opuntia dillenii is very widespread in the southeastern United States, Mexico, Bahamas, Cuba, Cayman Islands, Jamaica, Dominican Republic, Puerto Rico, Virgin Islands, Lesser Antilles, Dutch Antilles, and Ecuador. The plant is ornamental and cultivated as such throughout the tropics. Because of its invasion and colonizing potential it constitutes a serious threat to native species, habitats or ecosystems in dry and warm climates around the world. It is involved in dangerous infestations with several Opuntia species, notably Opuntia stricta (pest pear) in eastern Australia. Habitat and ecology: The native locations of O. dillenii are mostly at an altitude near sea level in sand dunes, at edges of maritime forests, or associated with tropical plants. The soil should be rather sandy than too heavy or even wet. It shows generally pH 5 or a somewhat higher value. Opuntia dillenii plants are relatively sensitive to frost. At an annual mean temperature of 20°C to 30°C they need at least 150 to 250 mm precipitation per annum, but accept also lower temperatures (on average 10°C to 20°C) combined with much rain (about 1000 mm per annum). Populations grows well in the shade of scattered trees, dense shadow leads to their degeneration beginning with the loss of flowering and fruiting. Although the flowers of Opuntia species are hermaphroditic, cross pollination by bees is the rule. After fertilization seeds develop which are eaten with the pulp by men and animals or released from overripe fruits. All these possibilities can be connected with a wide dispersal of seeds. It was observed that seeds of O. dillenii germinate best after intestinal passage. Since each areole has the ability to produce roots or shoots, asexual reproduction essentially contributes to the propagation of O. dillenii in nature. Broken parts of plants can be transported in animal coats or running water over long distances and grow out under suitable conditions after location on the ground. Opuntia stricta var. reitzii (Scheinvar) Scheinvar & A.Rodr. Description: Opuntia dillenii is a low, spreading bush growing in broad clumps and often forming dense thickets, or tall and much branched, 2 to 3 meters high, sometimes with distinct terete trunks. Derivation of specific name: This member of the Cactaceae family was given this name by Johann Jacob Dillenius (1648–1747), a German botanist and Professor of Botany at Oxford. Stem segments: Joints obovate to oblong, 7 to 40 cm long, 6-15(-20) cm wide, 1 to 2 cm thick, succulent, spiny, the margin more or less undulate, dull green or bluish green, somewhat glaucous, but bright green when young and irregularly trimmed with relatively few areoles. Roots: Shallow enabling to exploit limited rainfall, and rich in root hairs. Associations with fungi and bacteria can improve the capture of mineral nutrients. Areoles: Areoles somewhat elevated. Often large, filled with short brown or white wool when young, usually few and remote, on old joints 10 to 12 mm in diameter, glochids (short barbed bristles) numerous, conspicuous yellow up to 13 mm long forming striking tufts; wool in areoles short, sometimes brown, sometimes white. Leaves: Subulate, curved backward, pale green 3-6(-8) mm long. Spines: Extremely variable, spreading in a ll directions, usually 1-6, sometimes none, sometime 10 from an areole on first year joints, usually more or less flattened and curved, sometimes terete and straight, yellow, more or less brown-banded, or mottled, often brownish in age, 2.5-3.8 cm long, sometimes 5(-7) cm long, sometimes few or none. Flowers: Variable. In the typical form lemon-yellow to yellowish orange to orange, in some forms red from the first, 7 to 8 cm long. The perianth is rotate and reddish. Petals broadly obovate, 4 to 5 cm. long. The stamens are numerous and longer than the corolla, filaments greenish yellow. The style is stout, thick, white and there are 5-8 erect white stigmas-lobes. Fruit (berries): Pear-shaped to subglobose, truncate, depressed at the apex, narrowed at base, 5 to 7.5 cm long, deep reddish-purple when ripe, spineless, and bearing tiny tufts of glochidis. The fruits are edible. The juicy flesh of fruits is purple and contains many rounded seeds which are with an arillus-like envelop, about 4 mm in diameter and tan coloured. Chomosome number: 2n = 22. Notes: There is considerable dispute whether Opuntia dillenii belongs in Opuntia stricta or should be distinct. Opuntia zebrina f. reticulata hort. 4) Flora of North America Editorial Committee, “Magnoliophyta: Caryophyllidae, part 1. 4: i–xxiv, 1–559. In Fl. N. Amer.” Oxford University Press, New York. 2003. 6) Curt Backeberg “Die Cactaceae: Handbuch der Kakteenkunde”. 2 Edition, 1982. 7) Dubrovsky, J.G, North, G..B. “Root Structure and Function.” In: Nobel, P.
S. (Ed.) “Cacti. Biology and Uses.” University of California Press, Berkeley 2002. Cultivation and Propagation: Opuntia dillenii is a much decorative shrub-like cactus often found in cultivation. It is a tropical summer grower species that offers no cultivation difficulties. This cactus can be grown as a shrub, and may look attractive as it. Its green joints and yellow-orange flowers provide a striking accent for an otherwise dormant cactus garden. Hardiness: It is not a frost resistant cactus, hardy to -2° C or less if very dry. However in cultivation it is better not to expose it to temperatures lower than -5° C, even if in an aerated and protected location, in order to avoid the formation of anti-aesthetic spots on the epidermis. In presence of high atmospheric humidity avoid any frost as it is particularly sensitive to root rot. It can handle extremely high temperatures in summer. 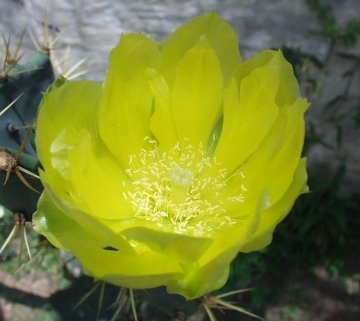 Traditional uses: Opuntia dillenii has a variety of medicinal uses, and fruits have been used for dyeing. Warning: Some clones are armed with treacherous spines that are extremely sharp. Handle it with extreme caution, and keep it away from gangways and areas frequented by children and animals. Spines must be meticulously removed with tweezers. Propagation: Can be propagated by cuttings. Prickly pear pads root easily and grow rapidly when placed in loose, well-draining soil.